VULVODYNIA... the nightmare of every woman.. or also one of the most vigorous brutal death metal bands of today. Choose what you would like to have the honour of meeting. If the latter one, do not miss the performance of this pack from South Africa at this year's OEF! There will be torture, there will be dissection but the main thing is the raw tracks from their latest album "Psychosadistic Design" will be thrown into the crowd and you will have to bang your head slowly with a smirk. They have been around in the scene for four years only but the base of their devoted fans has been growing thanks to their tireless gigging and travelling around the world. The South Africans actually feel almost at home in the Czech lands but have never before come to visit Trutnov's boards!!! Looking in a medical textbook will tell you the following: Vulvodynia is a chronic, severe vaginal pain with no identifiable cause. While the severe part is dead on, what a medical textbook won’t tell you is that Vulvodynia is also the pioneer in what is rapidly becoming South Africa’s most eviscerating export: slamming brutal death metal. 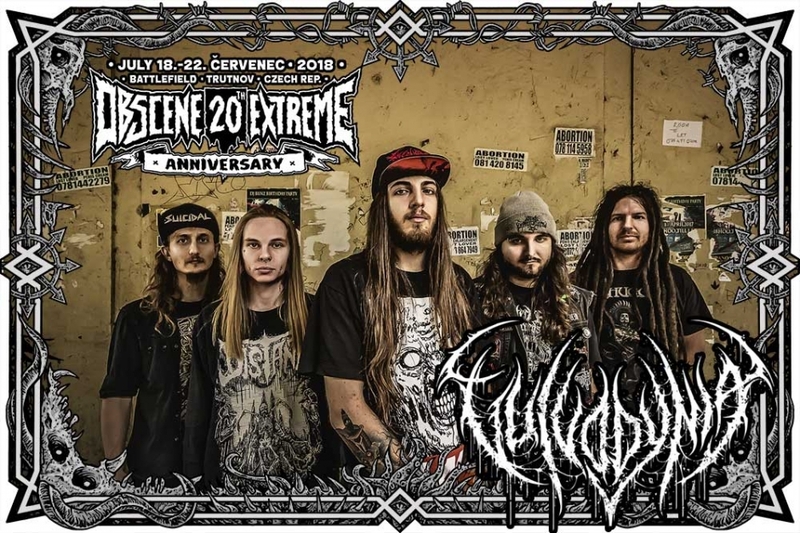 With lobotomizing, lurid riffs, skin-shredding blast beats and slams gruesome and filthy enough to induce septic shock, Vulvodynia are a lethal plague, spreading throughout the flesh of today’s heavy music scene—infecting one set of ears at a time, and leaving no survivors. Spawned in 2014 by Vocalist Duncan Bentley and Guitarist Luke Haarhoff, Vulvodynia is a South African slam juggernaut designed with one purpose: to make the craziest, most absurdly heavy music possible, while attempting to define themselves as more than just “another slam band.” If their mission was over-the-top heaviness, then consider it accomplished—from their debut release, Lord of Plagues, Vulvodynia’s penchant for skull-splitting technicality and eviscerating heaviness has been obvious. Rapidly gaining popularity and recognition for their prodigal slam prowess, Lord of Plagues saw the band reach ears not just in their local scene, but around the world as well. As the band’s popularity grew, their sound matured, drawing more from a greater array of influences and improving their musicianship and dynamic in August 2014 the band signed a two album contract with Australian Label ‘Vicious Instinct Records’ and added producer Byron Dunwoody in as second guitarist, in October of 2014, the band released their debut full-length album, Cognizant Castigation. Featuring Acrania’s Luke Griffin and Ingested’s Jason Evans (among many others), Cognizant Castigation is an album that cements Vulvodynia’s status as slam legends, transcending common gimmicks and staples of the genre and instead opting to generate an overwhelmingly crushing experience that fans of any style of heavy music will be able to get into. If 2014 was the year the band finally grew into their potential, 2015 was the year they shattered their own mold, evolving into an even more aggressive and creative display of no-holds-barred heaviness. The band released a lengthy-but-lurid eight track EP titled Finis Omnium Ignoratium, completing their contact with Vicious Instinct Records. No longer satisfied with their status as a terrifying trio, the band sought to expand—searching South Africa for more like-minded musicians willing to bring forth brutality. Vulvodynia’s search was not in vain—as they added drummer Thomas Hughes (Fuzigish, Haggis and Bong & All Forlorn), bassist Kris Xenopoulos (Carnage Carnival, Contrast the Water) and guitarist Matthew Mader (Your Cynical Sanity). With a full-fledged line-up confirmed, the band made their first moves sextet—a contribution to a multi-band Halloween split and a signing to the Czech-based label Lacerated Enemy Records. A packed 2015 well in the books, 2016 is looking no less busy. Already in the studio recording their next release, Psychosadistic Design, which is slated for a mid-spring street date. Never satisfied, the band will keep writing, as well as finalizing plans for a 2016 Europe tour and a 2017 U.S. tour to follow—proof that there is no way to predict just how far or how fast Vulvodynia’s sinister infection will spread.